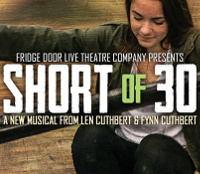 Short of 30 is a historical fiction musical about seven posthumous heroes from World War 2 that realize their significance from life and in death. Can these seven culturally diverse youth, all under the age of 30, coexist and continue what they started? Short of 30 was developed from the short play, Posthumous Friends that was written by Len Cuthbert and received a staged reading at the Geneva Theatre in Geneva, NY (April 2017), was produced at the InspiraTO Festival in Toronto (June 2017), and used for the InspiraTO’s Director’s Toolbox (January 2018). Please be advised that a water-based, low lying fog will be used in this production. See www.OnStageLive.ca for up-to-date information.